A drizzly Sunday was the day for Lara’s First tattoo, Here In my private studio In Mile end, Adelaide. I always find that first tattoos are special. They are a pivotal moment in someone’s life- some for personal growth, some for connection, some for memorials- But whatever the reason, Its always profound. 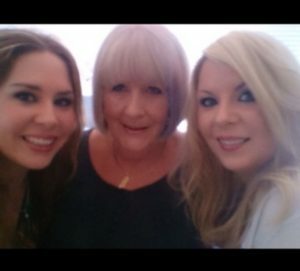 Lara came into my studio with her beautiful Mother and sister. 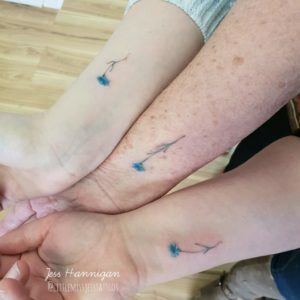 The three where incredibly close, each helping each other to share the nerves and excitement of their first tattoos with loving gestures and a cheeky sense of humour 🙂 This day, they where wanting a cornflower. The cornflower is the symbol for a disease called MND or motor neuron disease. This disease has already stricken this loving family a few times before, and As I learnt, There is no treatment- and no known cure. The love they had for each other was immense, And the design reflects their individuality and their growth together. ALS or Motor Neuron Disease as it’s generally known in Australia is a terminal disease, with no known treatment or cure. 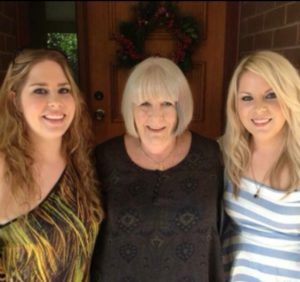 I lost my Father, Aunt, Grandma and GrandFather to this awful disease. In this particular disease the Motor Neurons (nerve cells) die, which stops the muscles from working.. making the person paralysed in their own body with their brain unaffected. It’s an extremely cruel way to die and very hard on loved ones and family members.. I was a very fit nurse before getting the disease, now I can only walk around my house, using a wheelchair every where else. The cornflower in the symbol for MND, we think Jess did a wonderful job creating the essence of the cornflower and its beauty. Having Jess chose the three different cornflowers, meant that we are all different people yet have walked the same path together. Always family and always connected even if we may be different and have different views, we love each other. At the end of the day, love is all that matters. It was an absolute Honour to tattoo these strong women, Your love and support for Lara and each other was all inspiring.